That was then. Remember the moment? All those years ago. 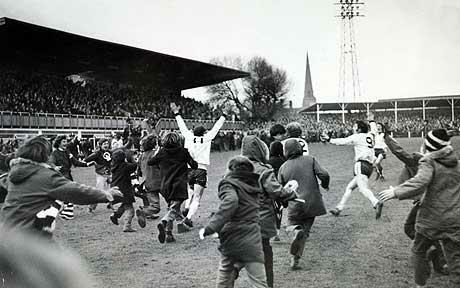 John Motson, he of the sheepskin coat, collar turned up against the chill, screaming “Ronnie Radford” as the Hereford United left winger peeled away, both arms aloft after firing in an improbable 30 yard equaliser on a mud-bath of an Edgar Road pitch against Newcastle United in the FA Cup. Radford was quickly engulfed in a fan invasion of the pitch, but with mud-splattered shirt, he became a ‘forever hero’ of almost every Hereford fan. It’s one of those iconic moments, and in the very definition of a cup shock result, Ricky George later pivoted to turn in the winner and vanquish the Geordies, Malcolm McDonald – who reportedly had forecasted a double hat-trick for himself – and all. But that was then. This is now. The Bulls progressed from that moment 42 years ago and with another couple of cup sojourns along the way, worked their way into the league pyramid proper for a few years, and even became relatively stable. Financial mismanagement, led them to tumble back to the Conference though. The tail-end of last season saw even that status in peril. A win at Aldershot in April saved them from relegation however, and there was great hope for the future when the Supporters’ Trust offered £220,000 towards clearing the club’s debt if they could secure its ownership for a nominal £1 fee. With a flagrant disregard for the supporters’ loyalty and largesse however, the club instead opted for a £2 bid from local businessman Tommy Agombar. If such a ridiculously fine tooth-comb adherence to financial matters had been applied earlier, the club surely wouldn’t have been in the situation it was. Seven days after the deal was done however, with the club still failing to clear its debt, and the deposit of a £350,000 bond looking as likely as another Radford 30 yard screamer, the club was expelled from the Conference. They now appear stuck in the Evo-Stik Southern League, and as if to book-end their fall, 42 years after Radford and George brought the club to national acclaim through their cup exploits, they lost n FA Cup first qualifying tie to East Midlands County League club, Ellistown & Ibstock in this season’s tournament. This is now. Hereford lost to Ibstock & Ellistown in the 1st qualifying round of this year’s FA Cup. 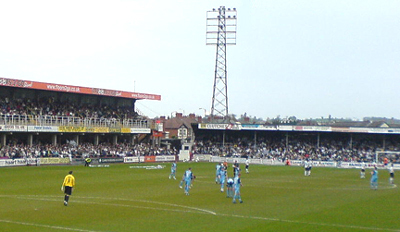 As Hereford sought to survive last season, fans – in the way that only football fans can – undertook all sorts of ventures to keep their club afloat. Raffles, bucket collections, even head-shaving were undertaken. Club photographer Steve Niblett even sold his collection of memorabilia to help fund his colleagues’ wages. It’s difficult to identify when the slippery slope first took Hereford into its grasp. Some will identify the takeover by local accountant David Keyte. Despite his occupation however, his tenure at the club was hardly marked by rapid financial growth and success. Financial problems and relegation performed a macabre dance together around the club’s demise as collapse followed. As the plummet continued, a series of Winding Up Orders were issued, including one from former manager Martin Foyle, over unpaid wages. Many staff lost their jobs, as others just turned into volunteers as money became as rare as hope. This, remember, is not the rarefied atmosphere of Premier League millionaires. Losing your job or not getting paid meant unpaid mortgages, with all that involves. Niblett recalled that “I’d just transfer (the sale money) to my bank account and go round to people’s houses and give them the money,” he said, adding, “I don’t think David Keyte is a nasty bloke. I think he’s just very incompetent.” Others may disagree with that charitable assessment. When Keyte sold to Agombar, it quickly became clear that this was no knight on a white steed. The fans discovered a ten year prison sentence for theft, and Keyte confessed that “It’s not the vicar coming along to buy the football club, is it?” Apparently not. The truth of that was probably borne out by the fact that Agombar even failed to pass the FA’s Owners and Directors Test. Remember this is the same check that a number of questionable characters have hurdled over since. Agombar was compelled to sell his share. It was two quid down the drain, I suppose; the price of another nail in the club’s coffin. Control however may not have been relinquished. The next chairman hardly inspired confidence either. Andy Lonsdale had held 21 appointments at 17 dissolved businesses and had been disqualified from being a director for six years. He also had a conviction for the illegal disposal of 600 tonnes of contaminated waste on green belt land. It was the sort of stuff the Hereford fans had rapidly become used to being dropped into. The reputation of the new board was hardly helped when rumours of property deals were voiced including plans to develop land alongside the club. Links with construction companies added to rumoured intrigue, whilst the board of the club tried to paint a lily white picture of aspirations, and denials were and are being issued. More the muddied shirt of Radford all those years ago perhaps, than the pure as the driven snow would be the view of many fans. A covenant apparently exists stipulating that football has to be played at Edgar Street forever. Cynicism among fans is however hardly surprising. Hereford United’s Edgar Street ground has seen better days, but what lies ahead? “That’s what the leases and the covenant on the ground say,” Hereford United Supporters Trust chairman Chris Williams has declared, “but if you pay enough money you can eliminate those conditions.” It’s difficult to argue. Especially for someone like the writer, whose local club had a similar covenant for their traditional home that now houses a Morrisons supermarket. Having despaired of gentle persuasion, fans of The Bulls are that desperate that a boycott is being deployed to try and save the club. Gates are down to an average this season of just over 400. Last season’s was more than four times that figure. More redundancies and player turnover has followed, accompanied by a number of Winding Up Orders being adjourned. Lonsdale has declared however that “I’m not going to give in. We’re here to win the war,” Lonsdale has trumpeted in defiance. In the hope of moving things forward however, Williams has offered to call off the fans’ boycott in exchange for a letter from Agombar guaranteeing the future of football at Edgar Street. Williams alleges that he was promised the letter would be received the following Monday. Regrettably, the promise was unfulfilled, and the boycott remains in place. Despite recent events wherein investment has been promised, unsurprisingly, Hereford United remain in a state of limbo, teetering on the very edge of a precipice. Earlier this week, a High Court judge granted the club a 14 day window to clear its debts amidst promises of money arriving. Very few fans however are convinced. Martin Watson, vice-president of the Supporters’ Trust who has put his own money into the cub in the past, has little faith in the present owners and sees only a shadow of the club remaining. “Many supporters believe the club died at the end of last season,” he declared. “They don’t recognise this season’s Hereford United as the one they followed.” This is now. This is reality for Hereford United fans. Hereford United may not figure very highly in the attention span of many football fans. A small club that flared brightly, but briefly, and then sank away, weighed down by debt and financial mismanagement. Football should take a care though. Once clubs became a vehicle for making money, rather than a sporting enterprise, any number of them were bound to be imperilled. Just ask Portsmouth fans. The south coast club plummeted through the divisions in a whirlwind of relegation and rapidly-changing ownership. Now however, the club resides in the hands of its fans. It survives in far less illustrious company by some measures, but it survives, and probably more of a true club than many others. Pompey fans have their club back. For Hereford United, the fight still goes on. To follow their progress, log onto Twitter and search for @wewantourclubback on Twitter. Remember, it could be your club next.